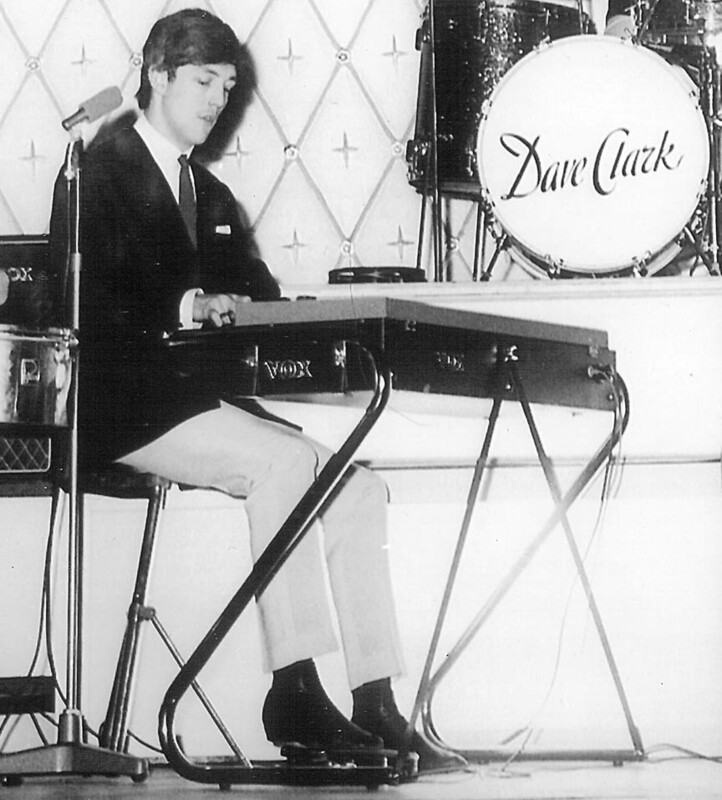 This 1963 photo shows the late Mike Smith of the Dave Clark Five with his early JMI Vox V301J Continental Organ. This high quality image was cropped from an original 8x10 glossy dealer promotional photograph supplied by Thomas Organ / Vox to their instrument dealers in the United States. This picture depicts the earliest version of the Vox Continental which had a more boxy orange lid. By 1964, the orange lids the JMI Continental had a more tapered appearance. These organs also had the gold plated gold -V-O-X- logo used on the Vox AC-30 amplifier. Mike Smith's organ shows two of these nameplates, doubtlessly to insure that the Vox name was prominentaly displayed by their celebrity endorsee. It is my understanding that less than one hundred V303J Continental organs were produced with this square orange lid. 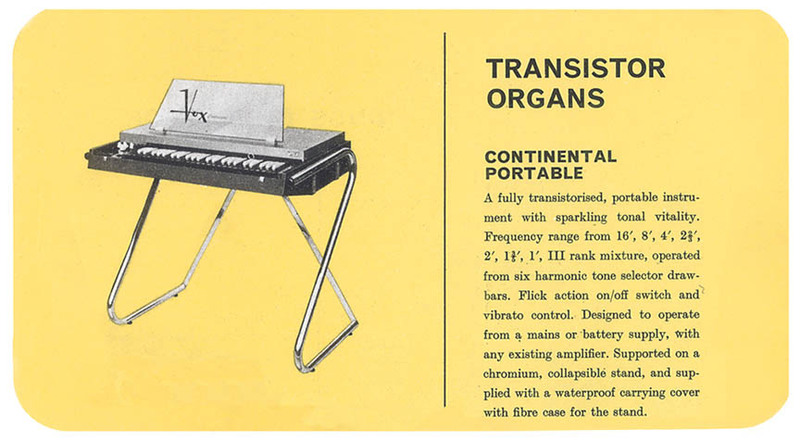 Pictured above is the "square top" V301J Continental Organ as shown in the 1964/65 Vox product catalog. It shows the "Perspex" or plexiglass music stand that was an included accessory for a brief time. 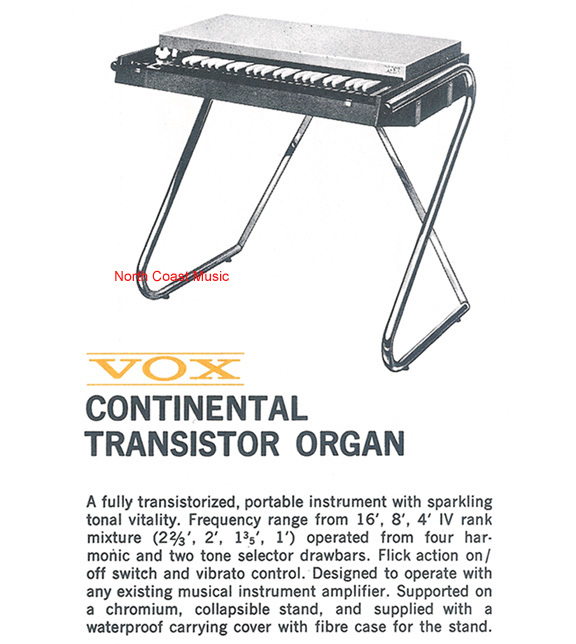 North Coast Music offers a factory authorized lithographed reprint of this 1964/65 Vox product catalog in the Vox area of the North Coast Music web site. Yet another photo of the "square top" V301J Continental Organ as shown in the 1964 Vox "King of the Beat" product catalog. North Coast Music also offers a factory authorized lithographed reprint of this 1964 "King of the Beat" Vox product catalog in the Vox area of the North Coast Music web site.